Brass brings a warm, burnished glow to household items—everything from switch plates and door knockers to bathroom fixtures, furniture, and even kitchen utensils. A strong and corrosion-resistant metal, brass is a relatively inexpensive alloy made from zinc and copper. On account of its bright, golden color, the material has long been a favorite material in home design. However, like any metal, brass can become dull and tarnished over time. Fortunately, with only a little bit of knowledge—and some elbow grease, too—you can learn how to clean brass and keep it clean for the long haul. Believe it or not, many effective brass-cleaning products are already in your kitchen! The first thing you need to determine is whether the item you wish to clean is, indeed, brass. 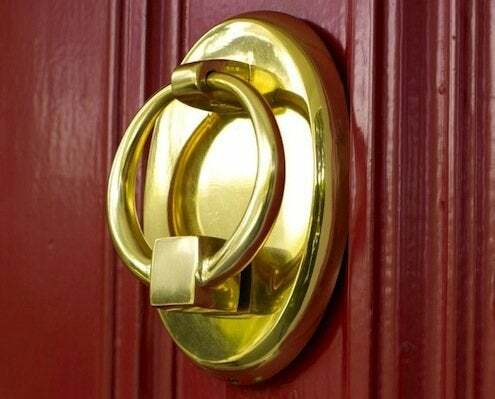 Though it may look like solid brass, it may in fact be brass-plated steel, zinc, or cast iron. The easiest way to check? Place a small magnet on the metal. Magnets will not stick to solid brass. So if the magnet sticks, the piece is brass-plated. Plated items can be cleaned with hot soapy water, but rubbing or polishing them too aggressively can remove the brass plating, so proceed with caution. Commercial metal cleaners and polishes can also be effective for cleaning brass and are commonly available at most home centers and supermarkets. Leading brands include Brasso, Bar Keepers Friend, Never Dull, Cameo, Hagerty and Blitz. Avoid using highly abrasive scrubbing cloths, metal-bristled brushes, or steel wool; these will scratch the surface of the brass. To prevent tarnishing, a thin coating of linseed oil or mineral oil can be applied to clean brass with a soft terry towel. Many brass objects are protected with a lacquer finish and should only be cleaned with hot, soapy water. If pieces of this type are heavily tarnished, you will need to remove the lacquer with a paint or varnish remover, clean and polish the brass using one of the techniques above, then re-lacquer the piece. You should avoid touching your brass items as much as possible; oils in your skin can hasten tarnishing. Regular cleaning and polishing with a microfiber cloth will help keep dust and dirt from accumulating and keep your brass accents lovely and lustrous.